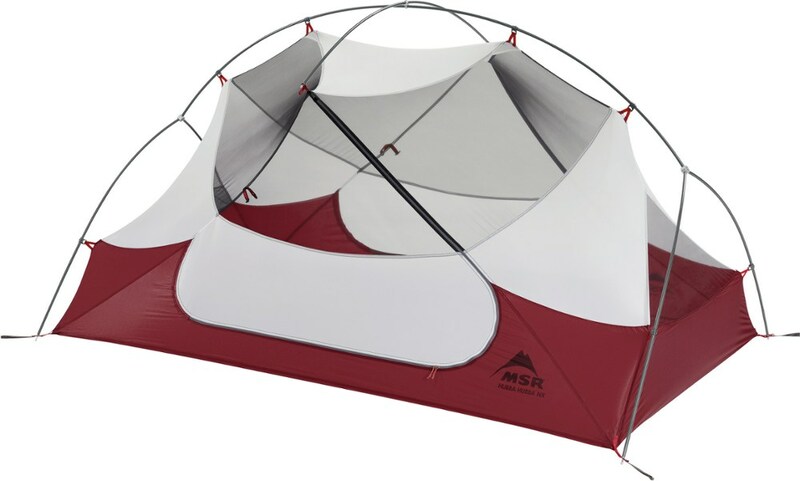 Lightweight two-person tent that pitches all in one. 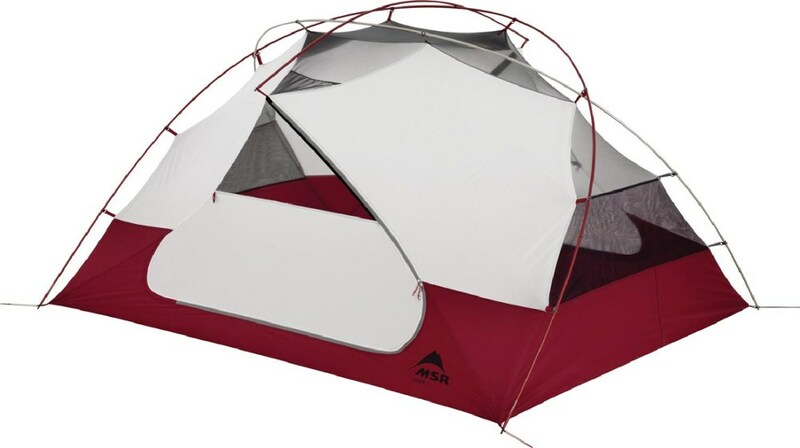 Lightweight two-person tent that pitches all in one. Cramped for two, but excellent for a solo hiker. 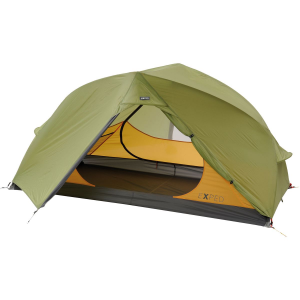 The Force Ten Helium 2 is a single-hoop tunnel tent which pitches all in one. 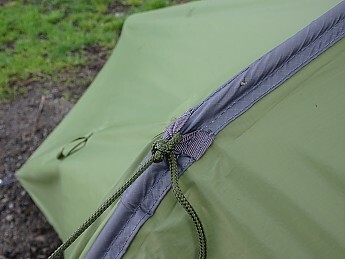 The inner is connected to the flysheet but has its own zipped doors. You can get in and out of the tent from either side. Each of the inner doors is part solid and part mesh. The bathtub-style groundsheet is an integral part of the inner. Setup is easy enough once you've tried it a couple of times. 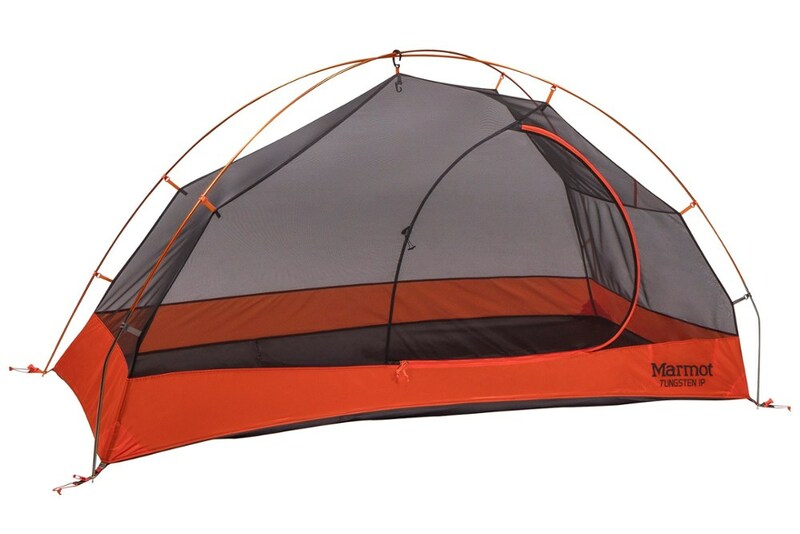 The tent uses eight pegs — one on each side to secure the centre hoop to the ground, one at each of the tent's four corners, and one at each end. The pegs are on the short side, but I have found them very secure except for one occasion where I pitched on dry, crumbly soil. On this occasion I placed rocks over the pegs to help secure the tent. 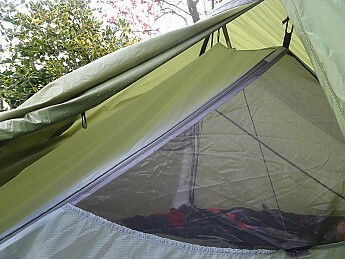 The end pegs serve to keep the ventilation flap at each end of the tent open. This flap corresponds to an area of mesh at each end of the inner and plays an important part in controlling condensation provided that you pitch end to the wind. Stability appears good provided the tent is taut, although I have yet to test it in bad conditions. 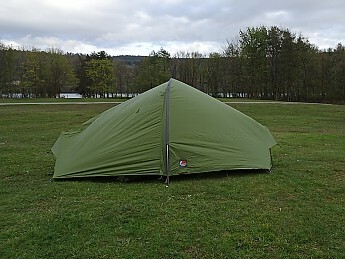 No matter how taut the tent is, however, wind will cause a bit of flapping. 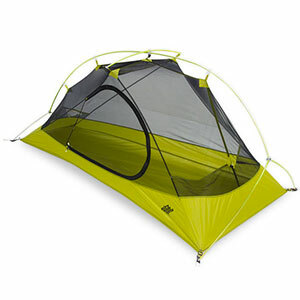 I have no experience with other tents so I cannot tell how the Helium 2 compares in this respect. Ventilation is excellent and if there is any wind at all condensation will be minimal. If there is no wind condensation can be heavy although the inner will keep it off you. I chose this tent because it was the lightest two-person tent I could afford. I camp solo but I wanted a two-person tent for the extra space. 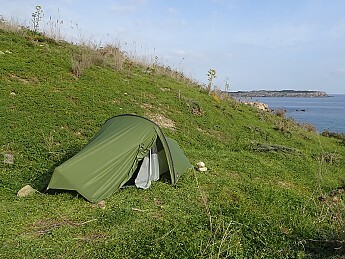 Truth is that two persons would find this tent cramped and they would have very little room for gear, but as a solo camper I can keep my 65-litre rucksack and most of my gear with me in the tent. This is a good thing because the vestibule is too small for my rucksack. I can store my boots and my camping stove in the vestibule but that's about it. As for the height of the inner, I am 6' 1" and I can sit up straight in the middle of the tent. This might not sound very impressive but while single-hoop tunnel tents are light in weight, they tend to lack vertical space. I believe, however, the Helium 2 is among the best in this class where vertical space is concerned. 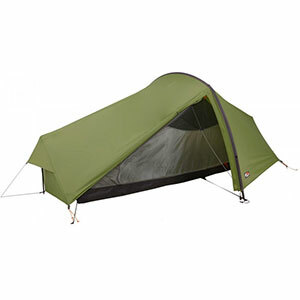 Force Ten quotes the weight of this tent as 1.43kg (3.15lb) and its packed dimensions as 45 x 16cm (17.7 x 6.3in). I have measured the packed weight of the tent as 1.416kg (3.122lb) — making it probably the only camping-related item I have that weighs less than advertised. I have not measured the packed size of the tent but 45 x 16cm sounds right — not the most compact there is, but easily accommodated in my 65l sack. 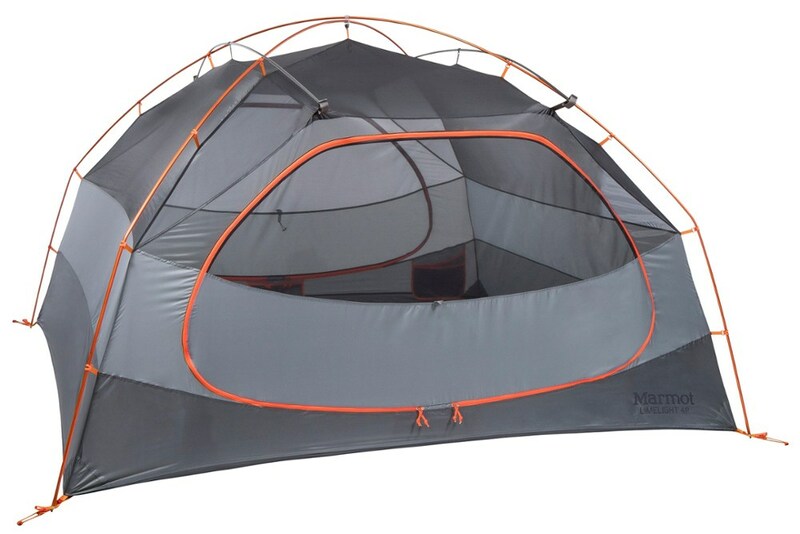 I have used the tent all of five times so I cannot comment about its durability. So far, however, it has served me well and I am happy with it. I wrote this review in May 2016 shortly after walking the Cumbria Way, a long-distance trail in England. The weather was kind to me then. In May 2017 I walked the West Highland Way, a Scottish trail, and the weather was not so kind. 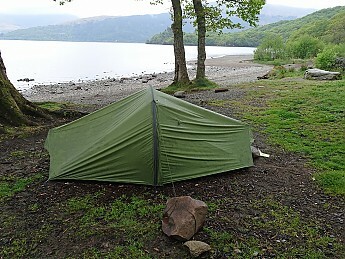 My West Highland Way trek took eight days and I camped for six nights. I encountered plenty of rain and occasionally strong winds too. My Force Ten Helium 2 coped with the rain admirably well, and not a drop got in. But I found it unnerving to lie in the tent watching the roof twist and shake in the wind. 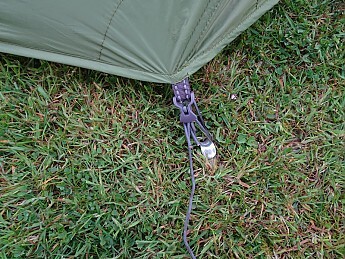 I noted that other tents had guylines attached to the upper sides for stability against sideways winds. Mine didn't. The central hoop is only pegged down at the ends, that is to say where the hoop meets the ground. Ideally, of course, you should pitch end to the wind, but winds change direction. 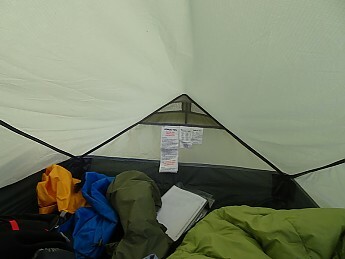 Then I realised that there was a fabric loop on the central hoop sleeve high up on each side of the tent. I hadn't noticed this feature before. I attached a length of paracord to each loop and tied the other end to a rock which I found for the purpose. Hey presto, my tent was now much more stable in the wind. I dare say the tent would have stood up to the winds even without the extra guying, but it gave me piece of mind. 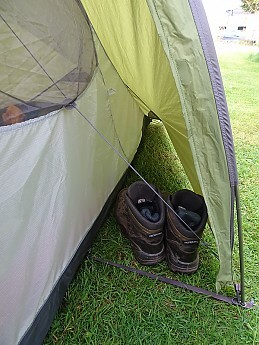 If I camp again in future I will obtain an extra pair of tent pegs to use instead of rocks. I might even replace my existing tent pegs. They hold the tent securely if they are driven all the way into the ground. 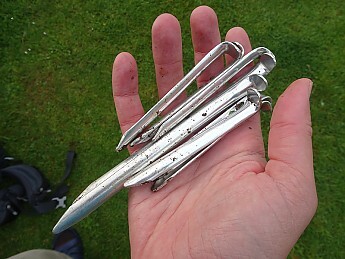 But at some campsites along the West Highland Way I found it very hard to push the pegs more than a couple of inches into the ground, and in trying I bent some of them. Perhaps the turf at these campsites was laid over a bed of gravel. The pegs are so malleable that I was able to straighten them by wedging them into a rubble wall and pulling the bent parts back into position with my hands. I'd be willing to pay a weight penalty for sturdier pegs. Thanks for the helpful review of your tent, Charles! Great review and great pictures, Charles! The helium looks really cool! Thanks for sharing! The Force Ten Helium 2 is not available from the stores we monitor.